3. Handicraft industry is a major source of income for rural communities, employing over six million (60 lakh) artisans who are mainly poor and majority of them are women. 5. Almost the entire handicrafts and handlooms sector are situated in geographic concentrations, called clusters. India is estimated to have around 2682 handicrafts and 491 handlooms clusters. 6. Uttar Pradesh leads both in handlooms and handicrafts. 7. Private Sector Provides Crucial Market Link to Handlooms clustors. 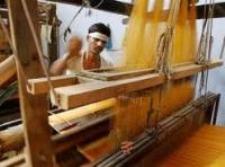 eg : Hand loom based weaving in Chanderi (Madhya Pradesh) is a centuries old activity. The cluster is known for its ethnic product with high design value.Fab India, which has handicraft retail outlet with branches all over India has tieup with this cluster. 9. As per the Handloom Census (2009-10),handloom is pre-dominently a rural activity with 36.33 lakh (83.88%) workers living in rural areas and 6.98 lakh (16.12%) in urban areas. Of the 43.4 lakh handloom workers, 50% i.e. 21.6 lakh belong to the North Eastern states and the remaining 21.8 lakh are distributed among other states. The handloom work force is predominantly female, constituting 77.4 per cent of the total work force. 10. The real incomes of handloom workers have declined over the years instead of increasing in tandem with the growth of the economy. 11. Khadi is referred to in Rigveda. 12. Bapu discovered khadi in 1908 when he was in London and during the non cooperation movement khadi became a symbol of the Indo-British battle over the looms of Manchester. 13. Pandit Nehru wove for his daughter Indira a wedding sari in pink khadi while he was in jail. This sari is still worn by women of the Nehru Gandhi family on their wedding day. 14. Being hand woven and handspun, each khadi fabric is distinct and exclusive. It has the added advantage of staying cool in summer and warm in winter, which is a rare quality among fabrics. Khadi also grows softer on each wash, and due to its hand woven structure, is comfortable and skin friendly. Rajiv Gandhi Shilpi Swasthya Bima Yojana- the first ever health insurance initiative for the artisans in the country, covering artisan, spouse and two children. 16. Mega Handloom Clusters - Government has set up four mega handloom clusters at Varanasi (Uttar Pradesh), Sivasagar (Assam), Virudhunagar (Tamilnadu) and Murshidabad (West Bengal).Each mega handloom cluster has at least 25,000 handlooms and will be developed in a time period of 5 years with an upper Central Government share of Rs.70.00 crore. 17. The price of mill made fabric is almost 30% less than handloom, and in an open undifferentiated market, handloom always loses out to power loom or mill made textiles. The unequal positioning of handloom with powerloom and mill and the imitation of handloom by mill and powerloom are the main reasons for the inability of the handloom product to demand competitive prices. 18. One of the measures taken up by the government to encourage the handloom industry is the ‘Handloom Reservation Act, 1985’. Under this Act, 22 (later reduced to 11) textile items have been reserved for the exclusive production by handlooms. However, the Act has never been implemented effectively. Its non- implementation has allowed powerloom imitations to flourish in the market. 19. Fair Trade is a concept of giving marginalized producers a chance to succeed at the market place that generally excludes them and using the purchasing power of consumers as a tool for real social and economic change. 20 The World Fair Trade Organization (WFTO) was created in 1989 to improve the livelihoods of disadvantaged producers by promoting and connecting fair trade organisations.In India, Fair Trade Forum- India (FTF-I) is the representative body of WFTO. Established in 2000, it has been working to sensitise the consumer as a tool to strengthen the producer.